Matt Willis, an Eagle Scout candidate, completed the restoration of an area in Pioneer Memorial Park on 4/17/2018. 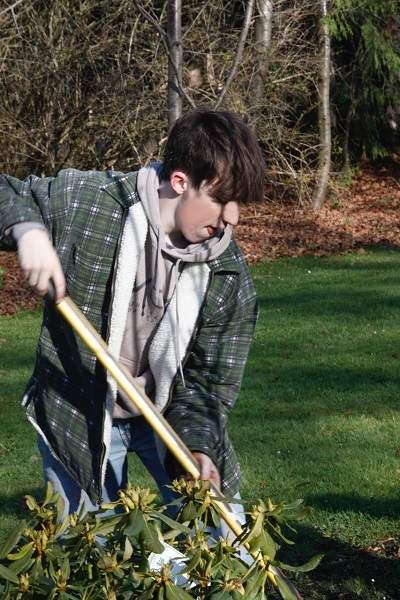 As a scout project, he took on the removal of an old maple tree stump and roots along with the “Sequim potatoes” in the area. He brought in new soil, a variety of plants and topped it off with a nice cover of bark. Plantings include a Japanese flowering cherry tree, rhododendron, azalea, candytuft, hellebores, bergenia and heather. The work was done by Matt, family members, other scouts and members of his church. Nicely done, Matt.